Joining veterans Ubisoft and EA, and newcomer Bethesda, Square Enix has just announced that they, too, will be hosting a press conference at E3 this June. Specifically, it will be happening on June 16 at 9:00 A.M. PST, so mark your calendars. It makes sense, as the busy developer has got a lot in the pipeline that we already know about, and I’m sure plenty that has yet to be announced. Between the recent announcement of Star Ocean 5, fans clamoring for a western release of Bravely Second, and everyone surely expecting follow-up information on Final Fantasy XV since the release of the demo in March, Square Enix should have no shortage of content to reveal. That’s only the tip of the iceberg, not even bringing former Eidos franchises into the conversation such as Tomb Raider and Deus Ex, both of which also have upcoming titles slated to drop this year. 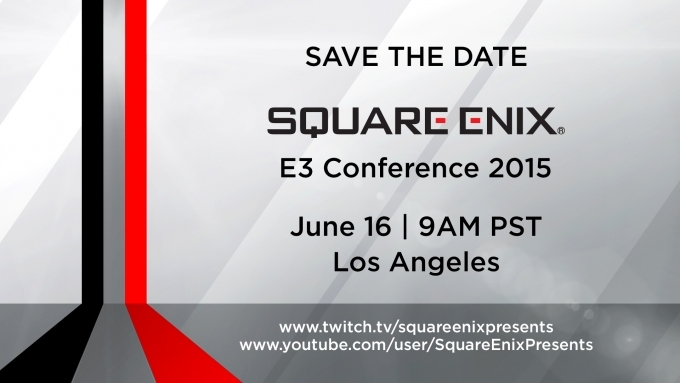 Square Enix encourages those unable to attend the event to watch the presser live from the comfort of their home, via their Square Enix Presents Twitch and YouTube channels. I definitely think you’ll want to bookmark those pages, and wait patiently for June 16.